Home > SL > Fiscal Stimulus to the Rescue? 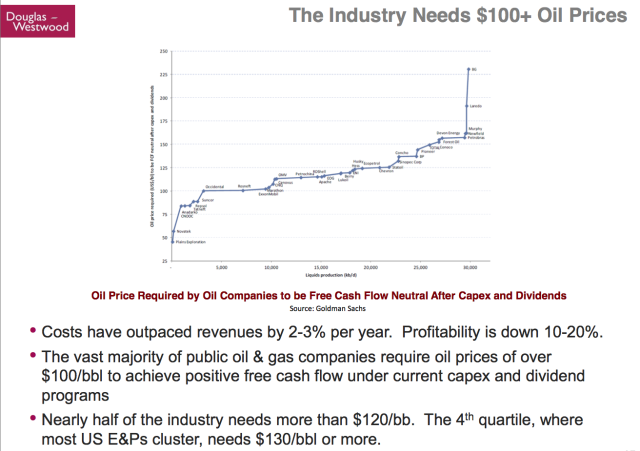 Fiscal Stimulus to the Rescue? When appearing before their political masters, central bankers, invariably, urge them to adopt an expansionary fiscal policy. Ben Bernanke, and now his successor, Janet Yellen have pleaded with Congress to adopt a more simulative fiscal policy. Mario Draghi continuously stresses the need for fiscal policy in support of the ECB's easy money policy. Most recently, the head of the IMF, Christine Lagarde, stated that some countries “may have room for fiscal expansion", citing Canada as one country that has "made the most of this space." 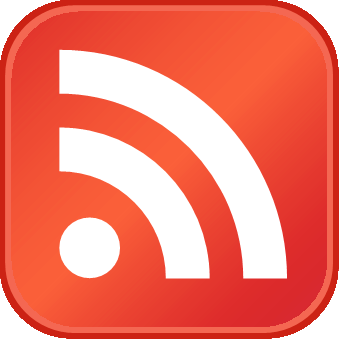 Indeed, the Governor of the Bank of Canada (BoC) has made it a selling point that they believe that Canada's latest fiscal stimulus measures will have a positive effect on the real GDP. In part, the fiscal policy shift has allowed the BoC to refrain from cutting its lending bank rate. Monetary policy is reaching its limits in terms of stimulating economic activity and has carried that burden well beyond what was envisioned immediately after the 2008 crisis. This blog looks at the issue of fiscal policy, especially the fiscal multipliers that are considered to be the drivers behind the movement towards fiscal expansion. The Keynesian multiplier is at the centre of the analytical debate regarding the impact of a central government's budget on promoting growth. Simply put, the multipliers measure the bang one gets for the fiscal buck .That is, the amount of short-run economic expansion one gets from a dollar of government spending, or, from changes in tax policy. 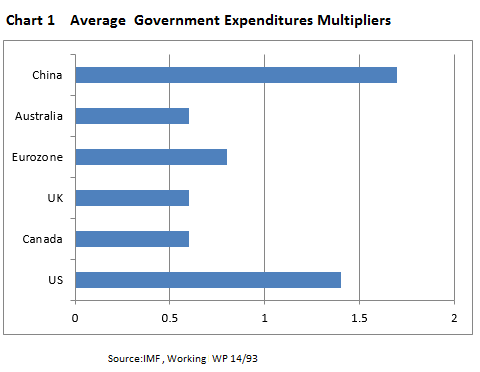 Multipliers can be calculated to measure any kind of expenditure change on GDP. Thus, for example, if government spending were to increase by $100, leading to an expansion of $150 in GDP, then the spending multiplier is 1.5. Other types of multipliers can measure the impact of government transfers or of specific tax changes affecting profits and wages. Using historical data, a recent IMF study calculated the average multiplier impact for major industrialized countries (see Chart 1). What is striking is the relatively wide-ranging implications of stimuli for these countries. The US and China have experienced a multiplier effect of 1.5 and 1.7, respectively; Canada, Australia and the Eurozone have experienced less effective results. We will return to this point later. Not all fiscal stimuli act with the same degree of potency. Chart 2 separates the type of stimulus between " investment" and "tax" measures. The governments obtain the greatest bang for the buck when undertaking infrastructure projects, both for their immediate impact on jobs and income as well as for their longer term benefits in adding to productive capacity (e.g. urban transportation systems). Next in importance are stimulus programs generated by increasing government consumption of goods and services (i.e. day-to-day expenses associated with government operations). Tax measures, on the other hand, have not proven to be anywhere nearly as effective in promoting growth. The impact of reductions in personal or corporate tax cuts are de minimis. Since some portion of a tax cut is usually saved rather than entering the spending stream, tax multipliers are lower than government spending multipliers. Thus, economists have long urged governments to look to stepping up their capital investment activities as the primary driver of fiscal stimulus policy. the stage of the business cycle. If the economy is fully utilizing all its resources, then a stimulus program would have no effect and might even worsen conditions as the government would tend to "crowd out" the private sector in the competition for workers and for physical and financial capital. This is not the situation today. Government expenditures simply will augment aggregate demand and contribute to overall growth without any inflationary results. In fact, recent research has shown the multipliers are likely be higher those of the past--- there is that much slack in the economy. Furthermore, some researchers even go further and argue that these expenditures will, in time, ease, not exacerbate the government’s long run budget constraint (1). reliance on international trade. For countries such as such as Canada, Australia and those in the Eurozone, international trade accounts for as much as 25 percent or more of national income. In these cases, there will be some leakage as consumers and businesses purchase products made overseas resulting a net reduction to national income. This may account for why the multipliers for those countries are lower than for the US and Japan which are more closed economies. the level of interest rates. As long as interest rates are less than growth in nominal income, the amortization of the additional liabilities will negative. This is a very cost-efficient means to finance long term infrastructure projects. on the fiscal policy mix. As we pointed out earlier, it is important to emphasize government " investment" expenditures over "tax" expenditures as a means of stimulating growth. The mix often depends on the political forces at work at the time that budgets are being drawn up. 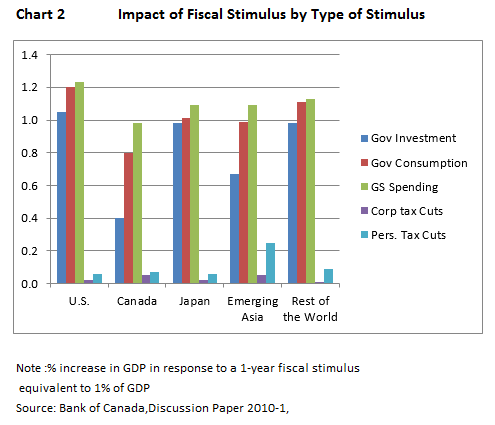 We did mention that economists debate the value of fiscal stimulus. 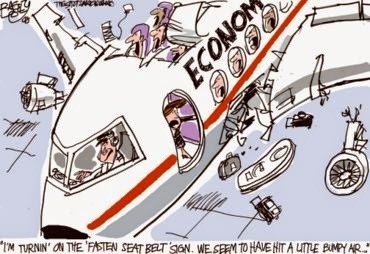 Some point to the experience of the US stimulus bill of 2008 had very little impact. However, that program was dominated by tax cuts which have the smallest impact of any stimulus measure. Also, the size of the program, roughly $750 billion was less than 1 percent of the economy and would not likely have produced the desired impact. The program was designed to kick start only, rather than to provide for sustained increase in economic activity. As the monetary policy options are exhausted, the industrialized countries are going to look to fiscal policy to boost growth. In the recent the G-20 meeting, the IMF recommended the G-20 stand ready to implement coordinated stimulus equal to 1 percent to 1.5 percent of GDP. More importantly, should this be a coordinated action the multipliers cumulative affects would be even greater than each country going it alone. Hence, the urging by the IMF to have the major players work together. A tall order, indeed.